description: All of the cockpits have Autopilot and Navigation consoles which are available by pressing ' shift-2 ' and ' shift-4 '. I found the autopilot window could be undocked and moved to a second monitor with very little impact on frame rate. Some also have a Horizontal Situation Indicator, and the B-45C Tornado has altimeter, airspeed and rate of climb as well. description: Fixed cockpits in most sims are great for instrument flying but don't really enable you to simulate real visual flight conditions, where most of the time the pilot's head and attention is out of the cockpit. Using the virtual cockpit with the HUD display gives a much better 'simulation' of the visual flying experience. 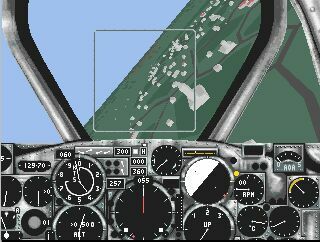 description: The virtual cockpit gauges function, as I expect them to in 2003, but they are rather blurry and the clarity doesn't improve on zooming in. description: This page describes NAV mode only - there are also Air to Air and Air to Ground modes. description: Anyway I was planning my F-16 cockpit, and a quick phone call to General Dynamics USA led to a nice chat with a senior manager and my request for a photo of the F-16A cockpit led to this arriving in the mail a week later! description: My first cockpit was scaled fairly closely to the F-16. Using calipers I multiplied the dimensions out to build a cardboard mockup and then a plywood and aluminium prototype. description: Unfortunately this book is out of print. description: The F-35 Cockpit demonstrator has 180 degrees of visuals and a fully working HOTAS, MFDs and flight controls. The first flight simulator in History. description: Francisco J. Campos reports: "in December 1927, the first commercial flight between Barcelona and Madrid for Spanish Airline Iberia took place with a huge success. This gave Doctor Andreu a great idea: create a ride for his park imitating a plane flight. He commissioned the construction of a replica from that plane, a German-made Rohrbach Roland able to transport 10 people and its crew. The plane was hanging from an elaborate crane rig, allowing it to fly in a circle pattern, powered by its own propeller. Since the whole contraption was placed in top of the mountain, and "flew" over open space, the passengers had the exact feeling of a real flight over the city."